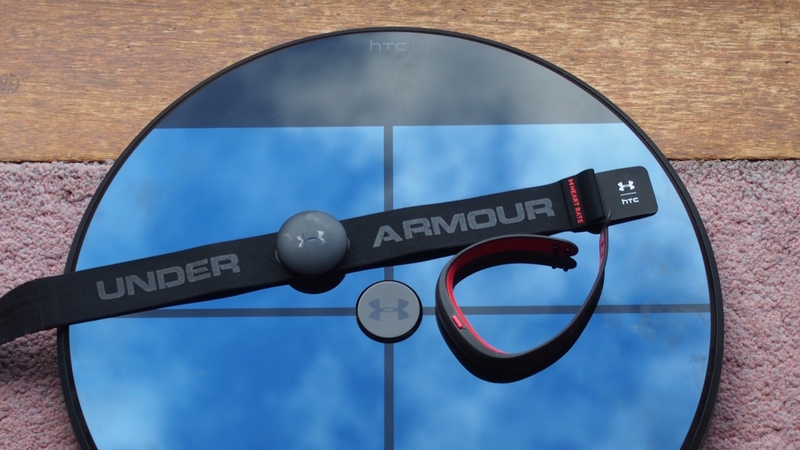 The UA HealthBox is Under Armour and HTC's first set of connected devices. It wants to be the only hardware you need in your life to track your health and fitness. In the pricey $400 box, you'll find the Under Armour Band, a set of Wi-Fi enabled smart scales, and a heart rate monitor chest strap. Bringing everything together is the UA Record smartphone app and there's more HealthBox kit you can buy separately as well. There's headphones that monitor heart rate from the ears and the Speedform Gemini 2 connected running shoes that can automatically detect your running. We've been living with the UA HealthBox for a couple of weeks now to find out if this $400 box of tech is well worth the money. Once you pull apart the doors of the big red box, the first thing you'll spot are the scales. Compared to your standard dumb scales, it's a big piece of kit so you're going to need a decent size bathroom to accommodate it. The circular design sets it apart from Garmin, Fitbit and the Withings Wi-Fi scales with a sleek pressure sensitive layer of glass on top and a plastic red base with a dimpled finish. In terms of attractiveness, this is the nicest looking piece of HealthBox kit. Unsurprisingly though, that glass panel is a haven for smudges, so you're going to need to give it a wipe down on a regular basis. It's free of cables though with a compartment in the base that already comes with 4 AA batteries in place. You're basically set to get measuring. So far, so good, until you need to pair the scales to the UA Record app over Bluetooth and then get it set up on a home Wi-Fi connection. This took me several attempts, stepping on and off the scales, before it eventually appeared in the synced devices section of the companion app. Next, it's time to step onto the scales to register your profile. There's a few things you need to need know before taking measurements though. It will only work on flat surfaces, it's best used with bare feet and according to Under Armour, it can take five or six measurements before it's properly calibrated. From then on, it should be case of stepping on and the device recognising it's you. It'll flash up a "hi" and then "step up". Except it doesn't always work like that. On more than a number of occasions it asked me whether I was a new user. At that point you have to go through a process of stepping one side of the scale to confirm that it's a regular user. In total, there's support for up to 8 users, so there's enough for a big family here. The scale is capable of taking standard weight measurement in either pounds of kilograms. It'll also take a body fat measurement, which requires standing on the scales for an extra few seconds. You need to turn on the body fat sensors in the UA Record app for this to work . If you have a weight goal set, it'll tell you how much progress you've made. My initial readings were a bit all over the place, but they did eventually level out. I compared readings to a standard pair of scales and the information was accurate. I had some problem with the body fat measurements as well and only managed to record one reading. Daily weight and body fat recordings are synced in real time, with a phone notification popping up to tell you a new reading is in. It's all very easily digestible information and you can get a clear indication on how you've progressed over a short or long period of time. There's also a body weight trends graph, but it's very basic. The real magic here should be the integration of nutrition app MyFitnessPal. The idea is that by logging meals and taking regular weight measurements, the software can get a better idea of how much weight you're gaining or losing. In principle it works, you just have to be willing to stay on top of keeping that data up to date. Hopefully, you've already had a read of our in-depth look at the UA Band, which will also be available separately from the HealthBox setup. If not, here's a quick summary. The fitness tracker offers solid 24/7 tracking, but it comes with a pretty average touchscreen and for the money, you can definitely find more capable trackers for less. It's arguably the weakest component of the HealthBox setup. What we have left is the heart rate chest strap. This is available to buy on its own in the UK for £69. The Band and the heart rate monitor chest strap do work together and there's a pretty good reason why. It's all do with the lack of continuous heart rate monitoring support in Under Armour's Band. If you prefer interval training to a brisk walk, and working out in specific heart rate zones, that's why the strap is included. It pretty much goes against the grain when you consider most companies are trying to move heart rate monitoring away from the chest, but it's an honest move that Under Armour and HTC don't believe the optical heart rate technology is cut out to deliver for intense training. The chest strap is slimmer than Polar's H7 and Garmin's Run heart rate monitor chest strap and essentially uses the same EKG method to track heart rate activity. That mean it's detecting the electrical activity from the heart to produce the bpm (beats per minute) readings. It's IPX7 water resistant, so it'll fend off sweat but it's not for the pool. It also uses a pretty standard coin cell battery giving you a year of battery life. Ultimately, there's two options for pairing here. You can sync it over Bluetooth with the UA Record app and initiate a workout from there. There's a blue LED light built into the clip-on sensor that indicates when pairing is successful. The other option is to pair to the UA Band, so you can see heart rate data in real time as well as current heart rate zone. The UA Heart Rate is the only chest strap that's capable of connecting to the Band in this way. So if you think you can just grab another external monitor, you're out of luck. In my Band review, I had problems setting this up, but eventually managed to get it to work. With the UA Record app closed, turning on the fitness tracking on the Band will activate the connection. Then you can swipe down screens to see the additional biometric data. In terms of accuracy, I really had a mixed experience. During a steady run with the chest strap paired to the UA Record app and testing it against the TomTom Spark, the readings were accurate. It was an entirely different story when I paired the chest strap to the Band. At least I thought it was. Running it against the Spark once again for some interval training, the live bpm readings were up in the 200bpm range on the Band and in the UA Record app. You can see in the screenshots below how ridiculous the readings apparently were. Clearly there has to be some issue here with how the data is being relayed to the Band, because having accessed the data through the Under Armour owned MapMyRun app it was a different story. I had to pay for a premium membership to see the heart rate data and it was more in line with the Spark's readings. When you log a workout in the UA Record app, you can see details on average heart rate, peak heart rate, intensity, and something called Willpower. This basically Under Armour's own measurement based on multiple things including age, gender, weight, heart rate. The higher the score, the harder you've worked. I managed a 9.72 but that was based on delivering an average 201bpm heart rate, which didn't happen. So this is what really matters here. It's nice to have a series of devices that can measure different aspects of your health, but the selling point is here how they combine to present fitness data fiends masses of insightful, useful information. Based on my experience, it's not such a harmonious relationship. I touched on some of the issues in my UA Band review and it's the issue of still needing to tap into several apps before you can really get full value from the UA Record app where everything is stored. You still need to have MyFitnessPal running to really get more reliable nutritional information insights. You still need to have access to the premium version of MapMyRun to access heart rate graphs and to compensate for the lack of GPS support in the Under Armour Band. What Under Armour does have on its side, is a well designed app, masses of third party app and device support and the potential of its IBM Watson insights. These insights are based on the data you log and crunched by a computer to hopefully make you improvements. Telling me that Under Armour community members who connect with other users, track more workouts than those who don't, didn't seem all that insightful. It could be brilliant in the future. Right now, it's just not there yet. There’s something very promising about what UA HealthBox aims to deliver. I think it will be great one day, but there's work to be done here, especially around that all important connected element. Then there’s the price. $400 is a lot of money for three bits of kit that you could probably buy alternatives individually for less. The Garmin Vivosmart costs around $90, a Garmin Run heart rate chest strap is about $99 and Garmin's Wi-Fi scales can be snapped up for $150. That’s three devices for under $350. The software remains the key ingredient here though and if Under Armour continues to add more connected kit that feeds into the ecosystem, it would be worth investing in for the future. If you're hoping for something that works perfectly out of the box, I'd hold onto your money.